Running numbers: 3700 - 3719. 1903 (3710 - 3719) to lot number 141. Original numbers: 3400 - 3409, 3433 - 3442. The prototype of what was to become the 'City' class, 'Atbara' class engine number 3705 Mauritius, was fitted with the larger Standard number 4 boiler in 1902. Ten new members were then built to the same dimensions in 1903, followed by another nine 'Atbara' rebuilds during 1907 - 1909. 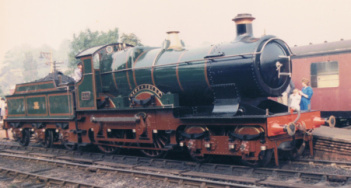 Claimed as the fastest locomotive of the day, number 3717 City of Truro ran at 102.3 miles per hour at Whiteball in 1904 and certainly the performance of the class is well recorded. Superheating of the class was first applied to number 3702 Halifax in June 1910 whereas top feed was introduced in 1912 and new cast iron chimneys in 1921. All engines were fitted with steam reversing gear but only a few, including 3716 City of London, had the gear replaced by the screw reverse. Unfortunately, wherever the class operated they were soon superseded by the new 4-6-0 classes on whatever services they were engaged and withdrawals began in October 1927 with number 3718 City of Winchester. 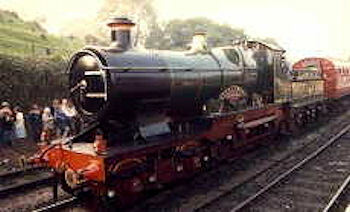 Due to the record set by City of Truro, this engine is preserved at the National Railway Museum, York.